So, it’s the 27th day of the shutdown — no movement on a deal for the border wall. And we shouldn’t expect one anytime soon. House Democrats aren’t playing ball with the Trump White House, though House Majority Leader Steny Hoyer (D-MD) said that a wall isn’t immoral if they keep people out. It’s a break from Speaker Pelosi recent rhetoric. On the southern border, we have a crisis that most in the liberal media think is a figment of the Trump administration’s imagination. Two thousand inadmissible migrants arrive every day, ICE arrested 266,000 criminal aliens, and 20,000 migrant children were smuggled into the country last month alone. 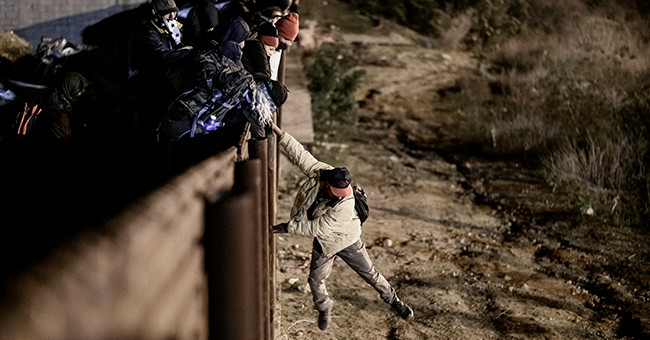 And now, we have another migrant horde setting off from Honduras. This sounds like an invasion, right? On the Hill, illegal immigration remains the root cause for the shutdown. I’m sensing this new caravan will provide Trump with some needed ammunition to pressure Democrats on the need for border security. In the meantime, Pelosi is trying to scuttle the State of the Union address because the government is shut down and due to security concerns. The Secret Service fact-checked her on the latter, stating they’re prepared to handle any situation and keep the president and the VIPs at the address safe. She’s just being her usual nutty, prickly, and insufferable self. It also doesn’t help that Democrats were partying it up in Puerto Rico during the shutdown, which shows that they couldn’t care less about re-opening the government. And last, we have a roving band of anti-Semitic congresswomen, all of them Democrats. In 2012, now-Rep. Ilhan Omar (D-MN) tweeted, “Israel has hypnotized the world, may Allah awaken the people and help them see the evil doings of Israel.” Today, she contested why this was offensive, and that she doesn’t see how Jewish Americans would be offended. Rep. Rashida Tlaib (D-MI), who made headlines when she said that they were going to impeach Trump, albeit with more colorful language, is a supporter of the viciously anti-Israel Boycott, Disinvestment, and Sanctions movement, which even liberal academia said was off the rails. We’ll see you guys next week.